Looking For Poverty Solutions? Do You And Your Staff of Professionals and Volunteers Want to Make a Difference In the World? Do You Want to See Lives Change and Families Prosper? Required reading for numerous outreach and development workers! Poverty solutions are indeed difficult. But in this book you will learn several ways that individuals, nonprofits, governments, private enterprise, and missionaries can improve the effectiveness of their efforts to help the poor. Current anti-poverty initiatives and programs need an upgrade! This is what “Alleviating Poverty/Advancing Prosperity” seeks to accomplish. About the author - Steven Downey is a Masters Degree holder in Crop Science and a 20-year veteran of missions and development work in Latin America and Africa. In this book he considers current antipoverty programs and challenges their state of affairs. He encourages us to rethink and re-strategize, using principles he has gathered through field experience working with the poor to bring about real, lasting change. 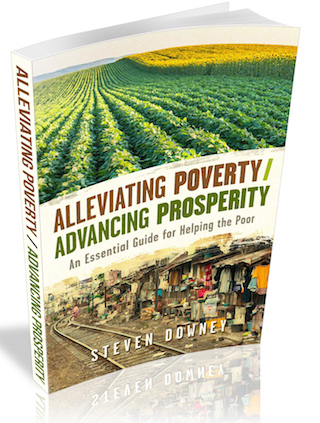 For just $12.99 (paperback) or $7.99 (ebook), you’ll have in your hands a valuable guide to help you become a more effective soldier in the fight against poverty. Find out how you can better help the poor in this world and become a torchbearer of prosperity and advancement. Click on Your Choice Below! Purchase the Paperback at Amazon.com! Click on the Icon to Get Tips for Downloading Your New Ebook!